‘Berlin: The Downfall 1945′ was first published in 2002 and written by acclaimed historian Antony Beevor. It tells the grim story of the last months of World War 2 in Europe and the bloody battle for Berlin. My paperback copy is 431 pages long and includes a large number of maps and a useful glossary. It begins at Christmas 1944. Berlin is being bombed by the Americans during the day and by the RAF during the night. The city is being reduced to rubble as the 3 million inhabitants struggle to find enough air raid shelters and realise that Hitler has led the country to ruin. But the thing that scares people most of all is the Red Army. The Soviet Union has 6.7 million soldiers on a front from the Baltic to the Adriatic and thousands of tanks, planes, heavy guns and the terrifying ‘katyusha’ rockets. They are 40 miles from Berlin and the only thing that stands between them and the capital are the scrapings from the bottom of the barrel; foreign SS, Hitler Youth, Luftwaffe pilots organised into army divisions because there are few planes left to fly, what is left of the Wehrmacht and the Volkssturm – Germany’s version of the Home Guard. The surreal and ruthless nature of Germany’s pointless resistance – orchestrated by an increasingly isolated and mad Hitler in a damp bunker – is shatteringly conveyed by Beevor who never forgets the human element to battles and carnage. One of Beevor’s most interesting themes is Stalin’s manipulation of his two most famous front Commanders – Zhukov and Konev. Stalin deliberately pits them against one another in a race to capture Berlin first. Stalin is mortified by the thought that the Americans and British will reach the capital first. In addition to geopolitical post-war considerations, his main motivation is the Kaiser Wilhelm Institute for Physics – the German atomic research facility. Known as the ‘Virus House’ it contained a cyclotron capable of generating 1.5 million volts and seven tons of uranium oxide. Beevor explains that the Soviets were way behind on atomic research and had no uranium supplies. The institute is vital and Stalin and his front Commanders happily sacrifice hundreds of thousands of soldiers in ill thought out attacks to get there as soon as possible. Beevor tells us that Rokossovsky, another famous Soviet front Commander, is held back by Stalin when it looks like he might reach Berlin himself just because he happens to have a Polish background. The book, in harrowing detail, details how millions of people died attempting to flee the Red Army. The Nazis had made no plans for evacuations simply because they couldn’t bring themselves to admit that defeat was at the door. When the Kriegsmarine (German Navy) desperately attempts to take out refugees by sea Soviet submarines mercilessly sink anything in sight killing thousands. The sinking of the Wilhelm Gustloff is the greatest maritime disaster in history. Much of this is familiar of course through other books and documentaries but Beevor brings a fresh slant to much of the material not least because of his extensive research in Russia. The book – understandably – didn’t go down very well there. On the 16th of April, 1945 over 20,000 Red Army heavy guns and katusya rocket batteries open fire on General Heinrici’s Army Group Vistula. Marshal Zhukov, Beevor tells us, is very proud of his new idea – huge searchlights will blind the German troops as battle commences; ‘Thousands of flares of many colours shot up into the air…this was the signal to the young women soldiers operating the 143 searchlights – one every 2000 metres. Along the whole length it was as bright as daylight. On the German side, everything was covered with smoke and thick fountains of earth in clumps flying up. There were flocks of scared birds, a constant humming, thunder, explosions.’ I have read accounts of this incident before but Beevor then tells us that the light from the huge searchlights, intended to dazzle and terrify the Germans, actually disorientates the Red Army instead when the light reflects back off the smoke and dust from the bombardment. Little insights like this make the book fascinating. 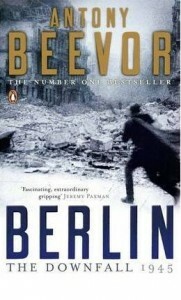 Beevor does a good job in not too forensically detailing events that have been covered extensively in other books – like test pilot Hanna Reitsch landing amongst the carnage of Berlin to visit Hitler and indeed the last days of Hitler – but instead gives the reader new insights in addition to giving us the complete picture. He also makes good use of Soviet (and German) propaganda and journalism and his analysis is always interesting. Beevor makes it fairly clear that in his opinion Stalin outwitted Eisenhower and Roosevelt in pretending Berlin wasn’t that important to him. It is fascinating to gradually reach the tipping point for the German Generals in charge of the remaining coherent armies. Heinrici, Wenck and Busse eventually ignore Hitler’s orders to try and save him in Berlin and instead concentrate on opening corridors for civilians to escape the Russians and reach the Western Allies. In the last days of the war incidents of Wehrmacht soldiers opening fire on the SS are reported. The carnage in a forest near Halbe as General Busse’s battered Ninth German Army and refugees attempt to reach safe lines is harrowing to read about. Beevor tells us each year bodies are still found and that in 1999 the Ninth Army’s Enigma machine was discovered in a shallow grave near the autobahn. There are many incredible incidents and passages in this book. An extraordinary passage details how the Red Army discovered a vast and abandoned German command post at Zossen with two huge complexes known as ‘Maybach I’ and ‘Maybach II’. Papers blow in the wind and the whole thing is hidden by trees and camouflage nets. In the empty bunkers below are teleprinters, maps, and countless telephones. Most incredible of all is a telephone exchange that had linked the two supreme headquarters when the Third Reich stretched from North Africa to the Volga. Only a caretaker and a couple of drunk German soldiers remain when the Soviets unearth this secret base. The actual battle for Berlin – a bloody and completely pointless one – is conveyed in its full horror by the author. A German Colonel who stood on top of the huge flak tower at Berlin Zoo recalls the shock of the sight that greeted him – ‘One had a panoramic view of the burning, smouldering and smoking great city, a scene which again and again shook one to the core.’ ‘Berlin: The Downfall 1945′ is chilling, vivid, educational and compelling. No Comments on "Berlin: The Downfall 1945"